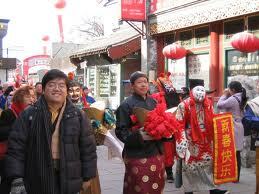 Liulichang Street is famous for collecting essence of Chinese culture. Tourists will find themselves surrounding by Chinese paintings, calligraphy works, antiques, handicrafts and other traditional Chinese items. Liulichang locates near the Peace Gate of Xicheng District, which is a part of Nancheng (the south part of downtown Beijing). As early as in Dynasty Yuan (1271-1368), Liulichang, indicating the glaze factory, had grown strong and prosperous day by day. All of the last three dynasties, Yuan, Ming ( 1368-1644 ) and Qing ( 1644-1911 ), were using glaze materials provided by Liulichang, to decorate their palaces, mansions and gardens, including the most famous Forbidden City and Summer Palace. When Dynasty Qing collapsing in 1911, lots of antiques drained away from the palace or places originally dominated by the government. At the same time, Liulichang welcomed its spring in developing itself to a distributing center of antiques and Chinese traditional treasures. Changing and reforming gradually, the factory has developed to a bazaar of antiques, calligraphy works, Chinese paintings, handicrafts and Chinese featured items, for example, the Four Treasures of the Study, refers to calligraphy brush, ink-stick, ink-slab and rice paper. Today’s Liulichang was renovated in early 1980s. Shops and vendors link with each other and sell, exchange, exhibit traditional Chinese antiques, and the scene makes the street fit for its origins. Liulichang Street contains many renowned shops, such as Rongbaozhai. This shop opens for hundreds of years. Its advanced employees for checking antiques are also the authoritative professionals of the whole country. China Bookshop, is another famous brand of the street. You can buy Chinese thread-bound books here, which cannot be easily found elsewhere.